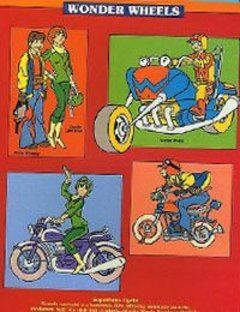 A 17-year-old journalist named Willie Wheeler (voiced by Micky Dolenz) and his girlfriend Dooley Lawrence (voiced by Susan Davis) solve crimes with the help of his superhero motorcycle, Wonder Wheels. Whenever Willie goes into action, he utters his catchphrase: “This looks like a job for Won-won-won-won-won-won-won-won-won-won-won-won-wonder Wheels!”. Then at the press of a button, Willie’s beat-up motorcycle transforms into a pimped out version with a mind of its own. Wonder Wheels continued to air as a segment on the shortened syndicated versions of The Skatebirds on Boomerang, and as an interstitial segment between shows.